Hypothesis Good preoperative glycemic control (hemoglobin A1c [HbA1c] levels <7%) is associated with decreased postoperative infections. Design Retrospective observational study using Veterans Affairs National Surgical Quality Improvement Program data from the Veterans Affairs Connecticut Healthcare System from January 1, 2000, through September 30, 2003. Setting Veterans Affairs Connecticut Healthcare System, a tertiary referral center and major university teaching site. Patients Six hundred forty-seven diabetic patients underwent major noncardiac surgery during the study period; 139 were excluded because the HbA1c levels were more than 180 days prior to surgery; 19 were excluded for other reasons; 490 diabetic patients were analyzed. The study patients were predominantly nonblack men with a median age of 71 years. Main Outcome Measures Primary outcomes were infectious complications, including pneumonia, wound infection, urinary tract infection, or sepsis. 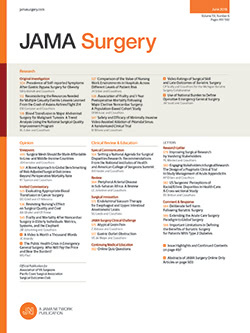 Bivariate analysis was used first to determine the association of each independent variable (age, race, diabetic treatment, American Society of Anesthesiologists classification, Activities of Daily Living assessment, elective vs emergent procedure, wound classification, operation length, and HbA1c levels) with outcome. Factors significant at P<.05 were used in a multivariable logistic regression model. Results In the multivariable model, age, American Society of Anesthesiologists class, operation length, wound class, and HbA1c levels were significantly associated with postoperative infections. Emergency/urgent cases and dependence in Activities of Daily Living were significant in bivariate analysis but failed to reach statistical significance in the multivariable model. An HbA1c level of less than 7% was significantly associated with decreased infectious complications with an adjusted odds ratio of 2.13 (95% confidence interval, 1.23-3.70) and a P value of .007. Conclusion Good preoperative glycemic control (HbA1c levels <7%) is associated with a decrease in infectious complications across a variety of surgical procedures. Postoperative infectious complications lead to poor overall outcomes and high health care costs, particularly for patients with diabetes mellitus for whom the risk of infection is greater and the outcome with infection is worse.1 Recent evidence suggests that hyperglycemia plays a significant role in the development of postoperative infections.2-5 Strategies to decrease postoperative morbidity by tightly controlling blood glucose in the postoperative setting have been very successful in both diabetic and nondiabetic patients. In a randomized trial of tight blood glucose control (4.5-6.1 mmol/L; 80-110 mg/dL) compared with standard control (<11.2 mmol/L; <200 mg/dL) in surgical intensive care unit patients, Van den Berghe et al6 demonstrated that strict postoperative blood glucose control not only significantly reduced morbidity, but also reduced mortality by as much as 42%. For diabetic patients, tight long-term glucose control as measured by the percentage of hemoglobin A1c (HbA1c) (see Table 1)7 has greatly decreased the incidence and severity of many chronic complications associated directly with diabetes, such as nephropathy, neuropathy, and retinopathy.8,9 Whether long-term metabolic control also helps mitigate acute infectious complications in the postoperative period has not been well established.4,10,11 We therefore chose to determine whether good preoperative glucose control, as indicated by HbA1c levels less than 7%,12 is associated with fewer postoperative infections in diabetic patients undergoing a variety of surgical procedures. In a retrospective cohort study, we analyzed data from the National Surgical Quality Improvement Program (NSQIP) database at the Veterans Affairs Connecticut Healthcare System (VACT), a 230-bed tertiary care center affiliated with the Yale University School of Medicine (West Haven, Conn). The NSQIP is a national program begun in the early 1990s that is designed to allow comparative assessments of surgical outcomes among facilities in the Veterans Affairs hospital system.13 Each of the hospitals performing major surgery in the Veterans Affairs system has a dedicated clinical nurse reviewer who prospectively collects preoperative, intraoperative, and 30-day outcome information on major noncardiac operations. Major operations include those performed under general, spinal, or epidural anesthesia as well as carotid endarterectomies and inguinal herniorrhaphies regardless of type of anesthesia. Data collected at each Veterans Affairs surgical center are sent to the Veterans Affairs Cooperative Studies Program Coordinating Center in Hines, Ill, for entry and analysis. Data from NSQIP for the local VACT database from January 1, 2000, through September 30, 2003, were used for this study. Hemoglobin A1c data were determined from patient electronic medical records. This study was approved by the human investigations committee at VACT. All diabetic patients undergoing major noncardiac surgery at VACT from January 1, 2000, through September 30, 2003, with HbA1c levels recorded within 180 days prior to surgery were eligible for the study. One hundred eighty days was selected as a criterion because biannual HbA1c testing is the suggested frequency for patients with well-controlled glucose.12 Only the first case for patients undergoing multiple surgeries was included. Patients who were considered to be septic preoperatively were also excluded from the study as were patients undergoing any procedures directly related to cardiac surgery. Demographic and clinical information was obtained through use of the NSQIP database and patient records. Age measured in years and race were demographic variables. The NSQIP defines race as black or several other categories of white. Because of the small numbers of patients in several of these categories, race was recorded as black or white plus other. Overall health and comorbidity was defined by 2 variables: American Society of Anesthesiologists (ASA) Physical Status score (1-5)14 and a functional status variable that defined patients as independent, partially dependent, and totally dependent in Activities of Daily Living (ADL).15 The type of diabetic therapy, oral or insulin, was included to determine whether treatment modality affected outcome. Data were coded as continuous variables for age in years and operative time in minutes. Dichotomous variables were coded as race (black vs white plus other), ASA score (1-3 vs 4-5), ADL assessment (independent vs partial or total dependence), case status (elective vs urgent/emergent), wound class (clean vs clean contaminated, contaminated, or dirty), diabetic therapy (oral vs insulin), and HbA1c levels (<7% vs ≥7%). Age and operation time were also analyzed as dichotomous variables based on the median value for the category. The primary outcomes were infectious complications: pneumonia, wound infection, urinary tract infection, or sepsis. All measures were defined explicitly by the NSQIP for consistency of data collection.13 Urinary tract infection was defined by the Centers for Disease Control and Prevention (Atlanta, Ga), based on a combination of symptoms, such as urgency, frequency, dysuria, and a urine culture with greater than 105 colonies/mL and no more than 2 species of organisms. Wound infections were classified as either superficial or deep, again defined per the Centers for Disease Control and Prevention as occurring at the site of incision within 30 days after surgery with purulent drainage. Pneumonia was also defined per the Centers for Disease Control and Prevention as inflammation of the lungs, based on physical examination criteria and an organism isolate and/or radiographic evidence. Pneumonia was included as an outcome only if the patient was not reported to have pneumonia preoperatively. Finally, sepsis was considered a clinical diagnosis characterized by fever and elevated white blood cell count, sometimes accompanied by hypotension, shock, and/or bacteremia as well as necessitating treatment with broad-spectrum antibiotics. Data collected from medical records and the NSQIP database were merged. Descriptive analyses were then done to quantify the relationship of each independent variable (age, race, diabetic treatment, ASA score, ADL assessment, case status, wound class, operation length, and HbA1c levels) with infections. Logistic regression was then used to determine the unadjusted association of each variable with the outcome. Logistic regression was also used, including the factors that were statistically significant at P<.05 in the unadjusted analyses, to produce adjusted results showing the independent impact of each factor on the outcome. Odds ratios and their corresponding confidence intervals and P values are reported. Analyses were done using SAS Version 8.2 (SAS Inc, Cary, NC). During the study period, 647 diabetic patients underwent major surgery. Of these patients, 588 had recorded HbA1c levels, and 509 of these patients were within the allotted time frame of 180 days for inclusion. Five cases were excluded because they were related to cardiac surgery. An additional 14 were excluded because of pre-existing sepsis prior to operation. A total of 490 patients were included in the final analysis. The characteristics of the patients are described in Table 2. The patients were predominantly male with a mean age of 71 years; most (87.8%) were white and other. Four hundred four patients (82.2%) were ASA class 1 through 3, and approximately the same number were considered functionally independent (81.8%) in their ADL. Most cases were performed on an elective basis (78.0%) with a median operative time of 115 minutes. Wound sites were classified as clean in 55.7% of the cases. Oral treatment was the main form of diabetic therapy (59.0%). The range of recorded HbA1c levels was 4.6% to 15.5% with a median level of 7.3%. The types of cases are described in Table 3; the major groups were urologic (21%), gastrointestinal/hepatobiliary (17%), vascular (16%), and orthopedic (13%). The percentages of patients with infections according to baseline characteristics are listed in Table 4. In unadjusted analyses listed in Table 5, factors associated (P<.05) with higher infectious risk included age, high ASA class, nonindependence in ADL, urgent/emergent status, nonclean wound class, and greater operation length; HbA1c levels greater than or equal to 7% were also significant whereas neither race nor type of diabetic treatment had an impact on outcome. The significant variables in the unadjusted analysis were then entered into a multiple logistic regression model (Table 5). In this analysis, ADL assessment and the urgency of the case were above the threshold of P<.05, whereas age, ASA class, wound class, operation length, and HbA1c levels continued to be significant (odds ratio, 2.13; confidence interval, 1.23-3.70; P = .007). The odds ratios generated by these analyses cannot be interpreted as relative risks because of the frequency of the outcome (17%). Nonetheless, the relative impact of the corresponding factors is evident. Our data show that good preoperative glycemic control, as measured by HbA1c levels less than 7%, is associated with a significantly lower risk of postoperative infections when adjusted for other factors that are known to influence this outcome. To date, only 3 articles have explored the question of whether long-term control of blood glucose affects the occurrence of postoperative infections. Each of these has been limited to the study of surgical site infections (SSIs; wound infections) in a group of patients undergoing a specific type of operation. In 1992, Bishop et al10 prospectively examined the influence of HbA1c levels on postoperative SSIs in 90 patients receiving penile prostheses of whom 32 were diabetic. Five infections were documented, all of which occurred in diabetic patients. Of these infections, 4 (31%) of 13 were in patients with HbA1c levels greater than 11.5% compared with only 1 (5%) of 19 among those with HbA1c levels less than 11.5%. The authors therefore recommended denying operations on the basis of their definition of poor diabetes control, HbA1c levels greater than or equal to 11.5%. This finding was widely adopted and, according to this research group, was “used as the ‘standard of care’ in several legal cases.”10 In 1998, Wilson et al11 refuted the importance of these findings. In a 2-year prospective study of 389 patients receiving penile prosthesis of whom 114 were diabetic, the authors found no association between HbA1c levels greater than or equal to 11.5% and SSIs. Ten infections occurred among diabetic patients with only 1 of those having poor glucose control. The numbers of subjects in the poor control group, however, was not mentioned. Both of these studies used an HbA1c level of 11.5% as the break point for analysis. Data from the Diabetes Control and Complications Trial group (Table 1)7,8 showed that HbA1c levels of 11.5% correlate with a mean blood glucose of more than 17.7 mmol/L (310 mg/dL). Using this level of glucose to define poor control places all patients with HbA1c levels between 7% and 11.5% in the well-controlled group, which is not consistent with present recommendations.12 These studies therefore do not answer the question of whether good glucose control influences the occurrence of infections. In our study of 490 patients, only 27 (5.5%) had HbA1c levels greater than 11.5%. A third study, by Latham et al,4 prospectively analyzed the association between HbA1c levels and SSIs in 1000 patients undergoing cardiac surgery of whom 300 were diabetic. The threshold for the analysis of HbA1c levels in this study was greater than or equal to 8%. Twice as many infections occurred in the high HbA1c group compared with the lower group (8% vs 4%), but this difference did not reach statistical significance. Interestingly, 78% of the poorly controlled group developed perioperative hyperglycemia compared with 43% of the better-controlled group. This difference was highly significant as was the difference in infection rates in patients who developed postoperative hyperglycemia compared with those who did not. In our analysis, we used the American Diabetes Association target of HbA1c levels of less than 7% to define good control. Patients underwent a variety of surgical procedures across multiple specialties. We evaluated all infectious complications rather than just SSIs. Although retrospective in design, the analysis was based on data from the NSQIP that were collected prospectively. The NSQIP also defines infectious complications specifically and captures 100% of the 30-day outcomes, which gives further strength to the data. Our results show that good long-term glycemic control is strongly associated with significantly fewer postoperative infections in a diverse surgical population. The data confirm the association of wound class and operation length with infection, and emergency setting approached statistical significance. The importance of serious comorbidity as defined by ASA class was also confirmed, although functional status did not reach significance. The type of diabetic treatment was not significant, but the utility of this measure is questionable because it reflects only the treatment at the time of surgery rather than the history of the disease. The other possibility for decreased postoperative infection with long-term glucose control is the overall improvement in general health and metabolic milieu of the well-controlled diabetic patient. The Diabetes Control and Complications Research Group8 proved that intensively monitored insulin therapy (via a pump), when compared with conventional therapy consisting of 1 or 2 daily insulin injections over a 6.5-year period, reduced the risk of retinopathy by as much as 76% in patients with type 1 diabetes. Intensive therapy also reduced the risk of albuminuria by 56% and the risk of microalbuminuria by 43% as well as reducing the risk of neuropathy by 69% when compared with conventional insulin treatment. Similar results were found in the United Kingdom Prospective Diabetes Study Group for patients with type 2 diabetes.9 In addition, evidence from epidemiologic studies12 and a recent meta-analysis33 suggest tight control results in a reduction in cardiovascular disease, although this finding has not yet been demonstrated in a randomized trial. There are several limitations to the present study. First, the study was conducted with patients from a single hospital site. Second, the patient population, because of the nature of Veterans Affairs hospitals, is predominantly male. Therefore, the findings may not be generalizable to a broader group of both male and female diabetic patients. Third, the NSQIP database did not allow us to determine the presence or absence of chronic complications in our study population. Finally, although we adjusted for several factors that are known to be associated with postoperative infections (wound classification, urgency of the case, length of operation), we did not control for other factors such as smoking history, nutritional status, and perioperative antibiotics, which also may have affected the results. In conclusion, this study confirmed an association between tight preoperative glucose control, as indicated by HbA1c levels less than 7%, and a decreased risk of postoperative infections across a spectrum of surgical cases. If the association is confirmed in other studies, strategies to improve glycemic control prior to elective surgery can be employed to decrease infections and improve overall outcomes for diabetic surgical patients. Correspondence: Ronnie Rosenthal, MS, MD, Surgical Service (112), 950 Campbell Ave, Yale University School of Medicine, West Haven, CT 06516 (ronnie.rosenthal@yale.edu). Accepted for Publication: December 2, 2005. Walt Biffl, MD, Providence, RI: It's a very nice paper with potentially very wide-ranging ramifications. In your background, you suggested this came about in part because of your perception that your VA had a large percentage of these infections. Where do you lie in the NSQIP database? Are you an outlier? As this is a potentially modifiable risk factor, is it modifiable once they hit the door of the hospital? Have you looked at the patients that got tight glucose control to see if that had an impact on those patients with a high hemoglobin A1c level? Dr Perkal: As far as where we lie in NSQIP, as I said, NSQIP allows you to compare different VAs with each other. As far as mortality, we are way below mortality. In regards to infection, we are above the national rate and that was what prompted us to look at it. As far as glucose control, it takes 8 to 12 weeks to change your hemoglobin A1c, so if you have an operation like a total hip or a total joint or maybe a hernia repair, and a patient comes to you with a hemoglobin A1c of 11, it would be reasonable to go back to the internist and say, “Hey, why don't we try to work on this and drop my patient's risk?” If it's a nonelective case, obviously you can't do that. We have looked at first postoperative glucoses and percent of infection. The data was a little harder to get and it has not been statistically analyzed, which is why I didn't present it as part of the body of the paper, but our patients who had higher glucoses initially had higher rates of infection, so their first postoperative glucose was definitely associated with higher infection rates. The patients with hemoglobin A1cs that were less than 7 had lower glucose ranges than their counterparts with higher hemoglobin A1cs. Their glucose ranges were much higher, indicating that the patients who are in good control are easier to control in the postoperative period. It is certainly something we are in the process of looking at. Pardon Kenney, MD, Boston, Mass: This is a nice paper. It is a neat example of how data which is coming out of the NSQIP is going to be useful. Faulkner is one of the 4 community hospitals that has participated in this as a pilot on the private side. My question has to do with antibiotics, which I don't think you mentioned. CMS and JCAHO have both been promulgating a national study called the National Surgical Infection Prevention Project, which among other things has guidelines in it about appropriate choice and timing and duration of preoperative prophylaxis. Could you comment about how that impacts your results? Dr Perkal: Certainly antibiotic choice, duration, and timing look to be important factors, and although the choice of antibiotics, the recommendations have been recently retracted to allow a little bit broader range for hospitals that have greater rates of methicillin-resistant Staph aureus. Our data here does not adjust for antibiotic timing or duration. It is something that we have started looking at in the last year and seeing if we could modify our infection risk along with glucose control, so we are taking a multiprong approach, which is less “clean” to be able to present in a forum like this. David Mooney, MD, Boston: I have 2 questions. One, in your first multivariable analysis when you included age and race, unless I misread it, your confidence interval for your hemoglobin A1c crossed 1, but when age and race were removed it no longer crossed 1. It was significant. That makes me a little concerned there could be some confounding going on with age and race that could be having an effect on your result. Second, I would assume that hemoglobin A1c is a pretty good reflection of the general state of health of the patient and their compliance with their health care prior to their procedure. Are there any other measures you could use to determine the general health status of the patients separate from their glucose control? Dr Perkal: Thank you. As to the statistical analysis, you are right. When that confidence interval went above 1 and they crossed, they may have some confounding effect. I’m not a statistician, and I’m not sure how I would sort that out without my statistician's help. The patients who have lower hemoglobin A1c do appear to be in general better state of health and that may be why they had better outcomes. This may be a reflection that they have less systemic illness and in addition that their neutrophil function is markedly improved with a better milieu of less hyperglycemia. Right now, we have only a moderate number of measures to otherwise evaluate patients' overall health status. Anesthetic risk criteria is one that tries to include multiple different risk factors. We know that albumin is a marker somewhat of nutritional status and weight gain/weight loss, so there are not that many assessments that are quick and easy and being able to be used. Hemoglobin A1c seems to be a measurable factor. Benedict Cosimi, MD, Boston: I’d like to just follow up on 1 of the questions of the first discussant. The question is, do you have any idea as to how long you would have to correct the glucose control preoperatively? For example, if you were scheduling a semielective herniorrhaphy, could you reduce the risk in days or months or what? Dr Perkal: To get the hemoglobin A1c corrected, it takes between 8 and 12 weeks. Now the question is, we don't know if that is going to—if you correct those patients partially, does it improve? If you have to correct them completely, is that what it takes? But it is 8 to 12 weeks.